How can they preach unless they are sent? 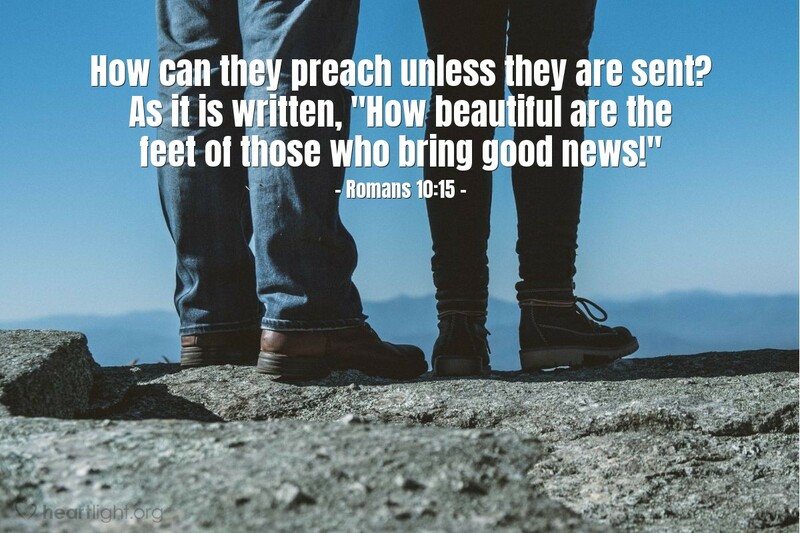 As it is written, "How beautiful are the feet of those who bring good news!" How beautiful are your feet? People with beautiful feet are either "sending folks" or they are "going folks" who share the good news of salvation in Jesus Christ. Which are you? If we're not one of those two options, we're Christians with ugly feet. Now nobody would want that to be said of him or her? So let's make a partnership agreement with other believers by either going and asking for their support and help, or by helping and supporting others while they are going! Almighty God of the nations, I know it pains your heart to see so many people in our world today that do not even know the name of your Son, much less trust in him as their Lord. Through your Holy Spirit, stir in us the desire to have beautiful feet just like our brothers and sisters had in those early chapters of the book of Acts. May the Gospel spread in our day as it did in theirs! In Jesus' name I pray. Amen.